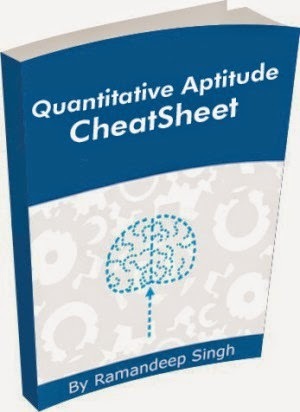 As many students finds difficulty in remembering Quantitative Aptitude formulae. Today I am releasing Cheetsheat to go through whole of the syllabus within 5 minutes. This 11 pages Cheat Sheet contains all the formulae you need to learn for any banking exam. Read it one day before the exam. waah sir kya sheet banayi hai..... maza aa gaya!!!! sir english digest kab tak upload karege.. I have qualified for the IBPS PO IV. In the instructions it is written that one has to obtain the NOC from its Employer to attend the interview . I am working in Haryana Govt School on Contractual basis. So, do i also have to ask my employer for NOC ? As it is not mentioned anywhere whether the contractual employees need NOC or not. Contract employees generally don't require NOC. Assuming that you don't have any bond with your school, at the time of leaving.